It’s challenging to be a divorced working mom. Being the only adult in the house and balancing employment, child-rearing, errands, household management, social obligations, personal fitness and recreation is stressful and overwhelming. Lots of parents – regardless of their marital status, gender, or employment status – likely feel the angst that comes with deciding what to cook, how to please everyone’s palates and dietary needs, how to get everyone sitting together at the table at dinnertime and having a civil conversation over the meal. People’s lives are busy. The number of families that regularly have dinner together has been falling for years. Reasons for the decline include, “We don’t have the time,” “The kids are too busy,”’ ‘We all have different tastes and diets,” and “I can’t cook in a way that pleases everybody.” As a result, relationships and communication suffer. There still are many benefits that can be realized from regularly sitting down with your family and having dinner together. Wonderful, happy and joyful things can happen over dinner. If you’re not having dinner together as a family, you’re missing out on those things. Dinnertime together offers the opportunity for genuine conversations with each other. When you talk together, you’re supporting each other, you’re solving problems as a team and you’re making plans together. The dinner table acts as a forum where you can let your guard down and show your love to each other. Children learn dining etiquette and other social skills around the family dinner table. They also learn about nutrition, food, and how to plan and prepare meals. Kids should be included in all of the steps—the shopping, the preparation, and the cooking. Kids as young as 4 or 5 years old can help. This instills family traditions and positive habits that will benefit them for the rest of their lives. Everyone should sit down together and eat at the same time. The meal is one that everyone will enjoy. The food being served should be nutritious. The meal meets every family members’ dietary restrictions. The meal can be prepared at a reasonable cost. 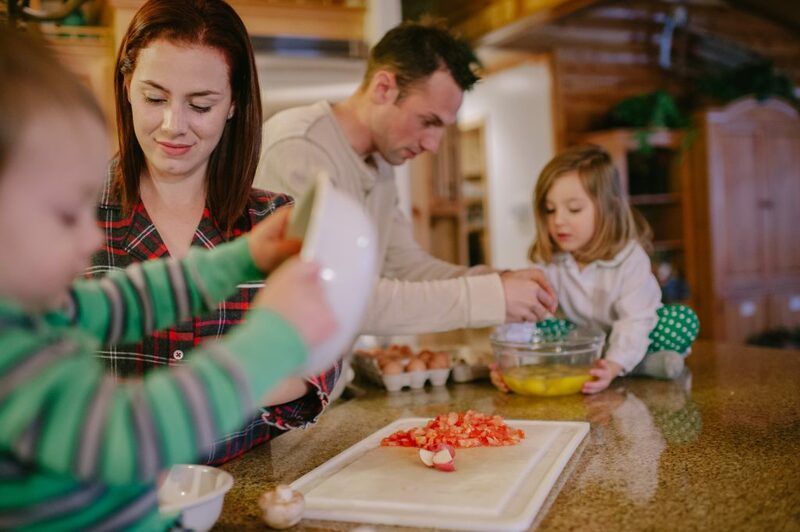 Here are seven easy tips that can help promote nutrition, family togetherness, and good taste around the dinner table. Plan meals ahead of time. Most people have a scheduled day off in their work schedules. On an off day, take the time to choose simple recipes for the week, make a list and shop for the needed ingredients. Then do of the prep work for all of the meals at one time. Cut the vegetables, prepare salads and store them in plastic bags, cook all of the meat. If you’re really short on time, buy pre-cut vegetables and meat. Then during the week, your meal preparation will go much quicker. If you can, work leftovers into your plans. Cook more than you need, and then stretch what’s left into another meal or two. For example, cut up leftover cooked chicken and make taco salads using shredded lettuce, crushed tortilla chips, guacamole, grated cheese and chopped tomatoes. Create your own versions of restaurant favorites. Ask your children what they like to eat at their favorite local restaurants. You might be surprised to find how easily you could recreate those meals. Use recipe websites. Such websites often include recipes that are healthy, delicious and relatively easy to prepare. Some even pair shopping lists with the recipes. Prepare the same meal for everybody. Preparing a different meal for each member of the family is very time-consuming. It also sends the wrong message. Everybody in the family should be eating the same meal. If there are different dietary restrictions or preferences, try serving dressings and sauces on the side. Buy prepared salads. Many stores carry such salads, which significantly cuts down on prep time. If you don’t like the dressing that comes with the salad, just buy a different one to use instead. Serve wine with dinner. Of course, only to the adults! Serving wine at dinner can help create a relaxed, festive atmosphere, which can increase the amount of time spent together at the table. Excessive drinking, however, will set a bad example for the children, so serve just one or two glasses. Let the kids make dessert. This gives them a role in meal preparation, and will make them feel more included in the overall process. One final note about family dinner together at home: The dinners you serve don’t need to be elaborate. Simple meals can be just as enjoyable as fancier ones. It’s the intangibles that make family dinners happy. Hearing your daughter’s news of the day, your son’s daily sports round-up, or your youngest kid’s memories from when they were little can bring warmth, laughter, encouragement, love and support to the table. Enjoy your time!